The details provide a summary of the radio link in text. The Azimuth degrees with respect to True north and magnetic north, and the Elevation angle in degrees with respect to the earth at the transmitter location. The variation in terrain elevation in meters. These are the results of the propagation model over the radio link. 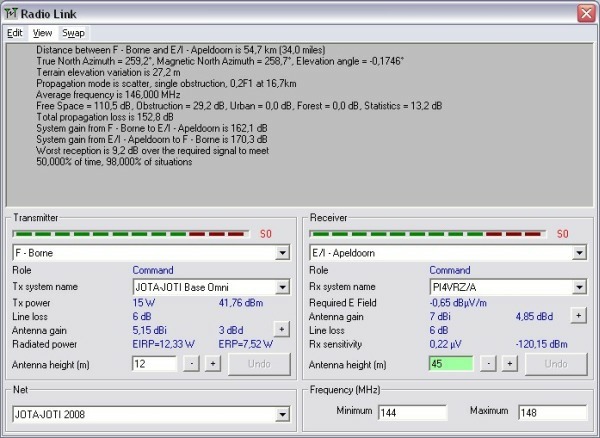 In this example the mode is "Scatter" and there is one single obstruction of 0,2F1 at 16,7 Km from the transmitter. The average of the minimum and the maximum frequency used in this simulation and at which the calculation is done. The individual values that are calculated in the propagation model in dB. The loss in dB as a result of the calculation using the propagation model between the TX and RX antenna. The lowest RSSI calculated on the radio link in dB with respect to the RX sensitivity. This message is only displayed when a warning is active. When the limitations of the model have been violated by the settings Radio Mobile will show a warning in red behind the path-loss value. The meaning of these warning can be found at model warnings. Example: The warning is in the red ellipse.